The music at EDC will stop at 5:30 am on Sunday morning (after Saturday night) and you’ll still want to hear some music so what’re you going to do? Find a way to Sapphire Pool and Day Club to party from 6 am to 6 pm. And then make it to the last night of EDC. The lineup features Hatiras and Donald Glaude, two old school names that have been around for a number of years and helped build this scene to what it is today. Las Vegas, the city that really doesn’t sleep! Sapphire Pool & Dayclub is the place to be on Sunday June 22, 2014 as they host the only early morning pool party beginning at 6am immediately following the EDC concert. Music will pump through the outdoor speakers as Donald Glaude provides the beats along with Hatiras and ten other local and national DJs. Guests can relax, hang out and sunbathe in plush cabanas or on daybeds and cushioned lounge chairs with lots of beautiful women from the club and enjoy signature cocktails and bottle specials sponsored by Piper Heidsieck Champagne, Don Julio Tequila and Ketel Orange offered by the glamorous cocktail servers. IV Rescue and Red Bull Las Vegas will also be sponsoring the days festivities. Complimentary pastries and confections will be provided by Peace Love & Pastry…sweet! 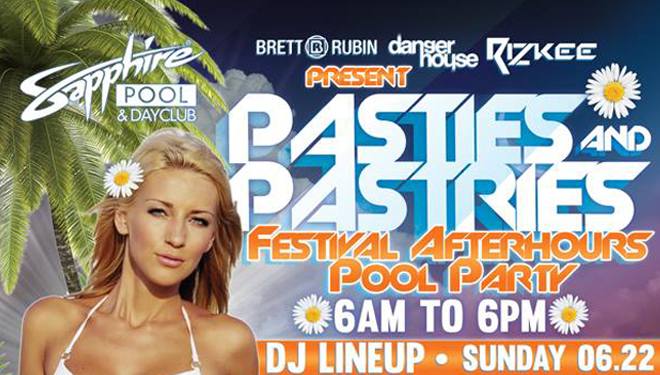 at Sapphire Pool & Day Club on Sunday morning immediately following saturday nights #EDC . Expect to hear the best in deep house, tech house, Nu disco, techno, and more. Out of state $20 At Door $10 presale with own transportation or use of sapphire complementary limo. if you feel like ballin out Vegas style , we have a $5,000 package available. This includes 5k in food and beverges, limo from EDC and a cabanan with private pool inside the party for up to 14. Email Brettrubin@hotmail.com with large group, or cabanna requests. You DON’T Wanna miss this one ! !